The BAM 2016 Tour started in Waseca and looped through host communities New Ulm, Springfield, Madelia and then back to Waseca. Along the way, cyclists took in the summer charm of South Central Minnesota while cycling between 60 and 80 miles each day. Wednesday, August 17. Cyclists began to gather in the late afternoon and evening at the Waseca County Fair grounds. Many pitched their tents and others stayed in the comfort of local hotels before heading out for four days of cycling. Thursday, August 18. Day 1 of Cycling. After breakfast, BAM Tour Director Mary Derks provided an overview of the route, the road markings, and safety. It was a beautiful, clear and sunny day. Early in the day, the Tour took riders by Farm America and along portions of the Sakatah Singing Hills State Trail and the Minnesota River. New Ulm, which offered Schell’s Brewery tours, dining at the historic Turner Hall, and camping with Herman the German high on the hill watching over us, was home for the evening. Friday, August 19. Day 2 of Cycling. Riders left New Ulm along quiet country roads and visited a Norwegian log home and Jeffers Petroglyphs, a national historic site of the Sioux Quartzite rock outcroppings featuring 5,000 American Indian rock carvings in a native prairie setting. Saturday, August 20. Day 3 of Cycling. From Springfield, the Tour headed to Mountain Lake for a stop at Heritage Village, then on to Butterfield where the 50th anniversary of the Butterfield Threshing Bee was in full swing, and off to Madelia for the evening. Sunday, August 21. Day 4 of Cycling. The final day of riding had us pedaling along river valleys en route to a refueling stop with pies in any flavor imaginable! 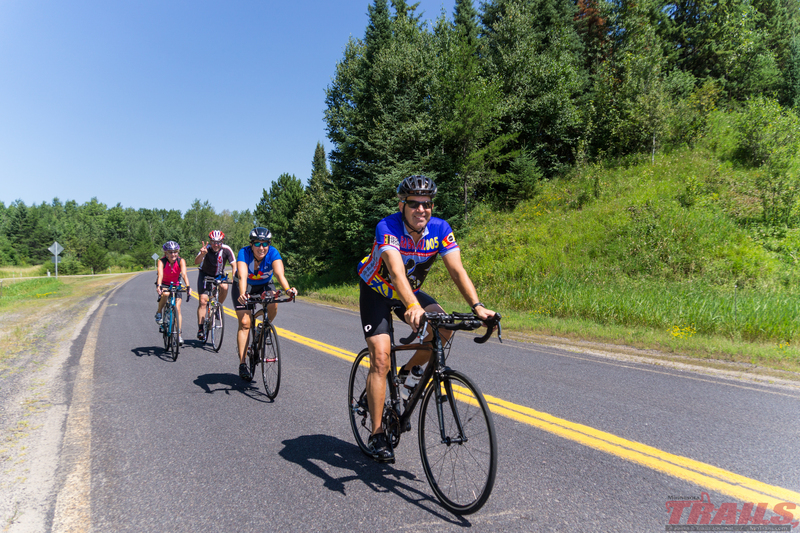 Back on the bikes, riders took in beautiful scenery of the Southern Minnesota Lakes Region, Madison Lake and Elysian–where many stopped for ice cream–before gliding into the Waseca County Fair grounds to retrieve our cars and bid farewell to fellow riders.